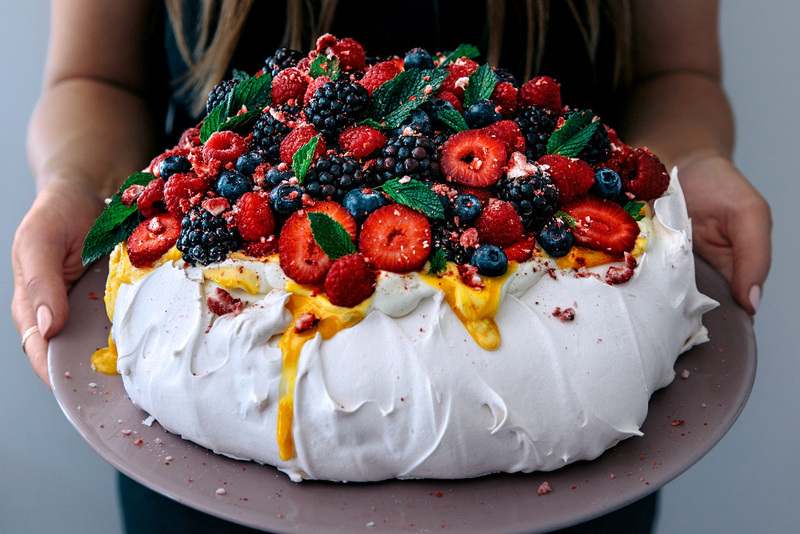 I'm super excited to share this Mega Pavlova recipe with you all! It has to be one of the most highly requested recipes I've posted on social media. It's also a family favourite in our household and requested every year for our Aussie Summer Christmas. I have two versions featured in the images and have included both options in the recipe below. There's a Berry with Lemon Curd & Fresh Mint version and also a Mango, Passionfruit & Lime with Toasted Coconut version. Feel free to use any fruit you have in season. You could create a tropical version with fresh mango, lime zest and lychees, or vanilla marinated strawberries with orange zest. Also, this recipe doesn’t strictly need to be a summer dessert, poached stone fruit, spiced pears or rhubarb would also be delicious. You could even add a teaspoon of cinnamon to the meringue mixture for a beautifully spiced meringue to go with the poached fruits. Yum! I like to assemble the pavlova pretty close to serving time, especially if I'm making the 'mega berry' version as the weight of the berries adds pressure to the meringue shell. I will have the cream whipped, berries washed and chopped, and mint leaves picked, all ready to go! Once the pavlova is assembled it will stay together nice and crisp for a few hours. If you leave the pav in the fridge overnight with the cream and fruit on top it will most likely go soft. It's best to add the toppings to the meringue just before you serve. Some meringue recipes call for corn flour or cornstarch to help stabilise the meringue. I personally have never used it as I don't like the texture and taste once it has been cooked. I find that a tablespoon of lemon juice works well and creates a thick and glossy meringue mixture that holds well. Hope you enjoy the recipe and please let me know if you have any questions via the comments below. I also have a Meringues with Vanilla Mascarpone Cream, Passionfruit Curd, Berries & Fresh Mint recipe that you may also be interested in. It's a mini version of this recipe! Also, if you haven't already, make sure you check out my other Christmas posts, especially my Quick & Healthy Christmas Pudding and my Free Christmas Gift Tags! Pre-heat oven to 150 degrees Celsius (300 Fahrenheit). Whip the egg whites on medium speed in a large clean bowl using a stand mixer or hand beaters. Whip the egg whites until soft peaks form (2-3 minutes). Gradually add the sugar to the egg whites (whipping the whole time) by adding 1 tablespoon at a time, waiting 20-30 seconds between each addition. Once all the sugar is incorporated whip the mixture on medium speed for 6 minutes. Next, add the lemon juice or vinegar and beat for a further 3-4 minutes. The final egg white mixture should be really thick and glossy. When you rub the mixture between your fingers there shouldn't be any grit from the sugar. If there is, whip the mixture for a few more minutes to ensure all of the sugar has dissolved. Scoop the meringue into a large mound in the centre of the tray. Shape the meringue into a round shape on the tray and spread out lightly with a spatula. Using the spatula around the outside of the meringue, create sweeping up motions to create a rounded and tall edge. Place the tray into the preheated oven and lower the temperature to 110 degrees Celsius (230 Fahrenheit). Bake for 2 hours and 30 minutes. Turn the oven off and leave the meringue in the oven with the door closed to completely cool. This step is very important, don't be tempted to remove the meringue any earlier. Leaving it overnight is a great way to ensure its completely cooled. Otherwise, 4-5 hours should be enough. Remove the meringue from the oven once its cool. While the meringue is cooking, let’s make the curd. This is a great way to use the egg yolks that may otherwise go to waste! In a medium saucepan whisk together the egg yolks, sugar, lemon zest and lemon juice (or passion fruit pulp). Stir continuously over medium heat until the mixture becomes thick. Add the chopped butter (or coconut oil) and stir to combine and until it’s all melted and well incorporated. Whip the cream and vanilla until stiff peaks form - whip on a low to medium speed or by hand, ensuring the cream stays smooth and doesn’t curdle. Fold the mascarpone (or vanilla custard or thick yoghurt) into the whipped cream. Dollop the vanilla cream over the meringue.